In Germany, which is often touted as a renting paradise, tenants can stay indefinitely and will face eviction only if they break the law: for example incurring rent arrears or using anti-social behaviour. Even a landlord selling up does not necessarily result in tenants having to move on, and in some cases children can even inherit tenancies from parents. How can this be? For a landlords, letting a property indefinitely is risky if the rent could end up being significantly less than they could get if they relet to a new tenant, at market rates. And yet, about half of all housing in Germany is privately rented, so there can be no shortage of willing landlords. In Germany individual investors comprise of approximately 60% of the market and the average size of individual holdings … can range from six to 45 dwellings. 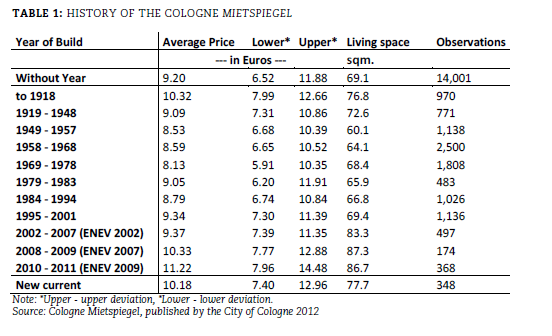 The Mietspiegel is an objective and statistical calculation of the customary local reference rent. market income level is set without obstruction of the tenants. 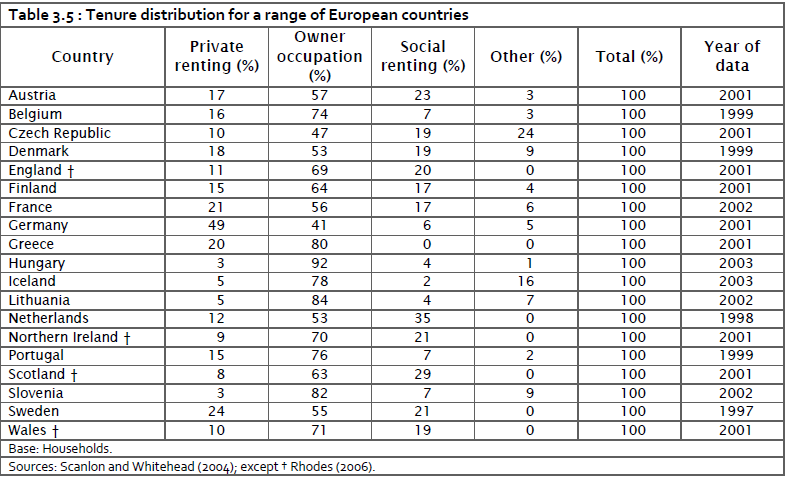 Many European countries impose limits on rent increases. In Ireland and parts of France, they are controlled according to market levels in the same area. The 1971 Reform implemented in practice a rent index, although only through the principle of rents being comparable to the market prices. The simple Mietspiegel has sometimes between referred to as the “Bordeaux-Mietspiegel”, whereby the tenant and landlord associations in certain towns have come to collective agreements as to the figures in the Mietspiegel over a bottle of wine, rather than by a statistical methodology. In itself this is not exactly regulation, because when negotiating a new rental agreement, landlords can still ask for higher rents, or may agree to lower rents if the property is hard to let. These new rents will then be reflected in the local “Rent Mirror”, and so result in changes to the rents paid on all tenancies using it. Government regulation outlaws rent rises of more than 20% over three years, but with relatively low inflation, this will not generally be relevant. Without the second of these, the abolition of Section 21 evictions is likely to lead to landlords getting out of the sector. Most properties affected will then be sold for owner occupation, so making housing more affordable for those just about able to buy – although in a weak market, this may not be a great idea. For those for whom there is no prospect of buying at today’s prices, and who ever want to move, it is bad news, because the supply of rented properties will go down, and they will end up paying more rent. Since most renters do expect to move, this means most renters will lose, even though the abolition of Section 21 will benefit existing tenants until they do want to move. However, this is likely to apply mainly to old style regulated tenancies, where landlords do not have the power of Section 21. On the face of it, the methodology used to calculate such “fair and realistic rents” could be used to publish UK Rent Mirrors, but landlords and their agents will be suspicious. I have anecdotal evidence of a recently assessed “fair and realistic rent” on a regulated tenancy resulting in a rent per sq. metre about 50% of the market level for similar nearby properties. The history of the UK private rented sector, which was stalled before the introduction of assured shorthold tenancies, with the power of Section 21 for landlords, also suggests that “fair and realistic rents” have not been in line with local average rents. It is conceivable that a new Rent Mirror could be introduced in parallel, which landlords would trust to “ensure an appropriate market income level”, but it would be perverse not to use the knowledge base of government agents – staff of the Valuations Office Agency – in this. To progress, we need to understand more about how this current system operates, and help it develop into one which can succeed in really fixing the private rented sector. Shelter would like to see rent increases tied to inflation within five-year tenancies. This would enable tenants to plan their finances, but allow landlords to obtain market rents at the beginning and end of each five-year period. It would certainly be better to use this than RPI for longer term rental contracts, and using regional rather than the national indices, but more local indices would probably go beyond the ONS methodology. However, getting their methodology to join up with the VOA approach would be helpful. There is no maximum length but it is meant to be for a relatively short period otherwise why would it be called an Assured Shorthold Tenancy? 1. For a term of 3 years or under it does not have to be witnessed and can be drawn up by a landlord & tenant quite simply. 2. Over 3 years then it does have to be signed as a deed and witnessed. 3. If you want to grant a tenancy of more than 7 years then you should use a tenancy at common law as you could make a tenant responsible for all repairs if you wanted to! (quite common in commercial tenancies). You would need to ensure it does not come under the Landlord & Tenant Act 1954 or you could be stuck with the tenant. 4. For tenancies over 21 years then different rules apply. The moral is therefore keep it short! The moral I draw from this not to keep it short, but to make sure lawyers as well as economists are involved in fixing the rental market for real. Before anything, however, we need an understanding that better ways are needed for setting rents on longer term tenancies, that these will need the buy in of landlords and their agents, and that they will involve an accurate reflection of local market rents. The history of their development in Germany suggests they were pioneered at a municipal level before being required nationwide by central government, but still operated locally. Even if the data used in the most sophisticated German municipalities is not immediately available for any UK local government, a lot of data will be available across different parts of government, and a better system than currently available for setting rents on longer term tenancies could be developed. It needs one local government to pioneer such an approach, and a department of central government to sponsor it.